There was a recent study of ravens that found they can plan. They can do the simple-to-humans function of planning for future possibilities. Only known to be a capability of humans and apes before, ravens (or, corvids) have now joined the elite thinkers of planet Earth. But, what does planning have to do with productivity? Why, everything! 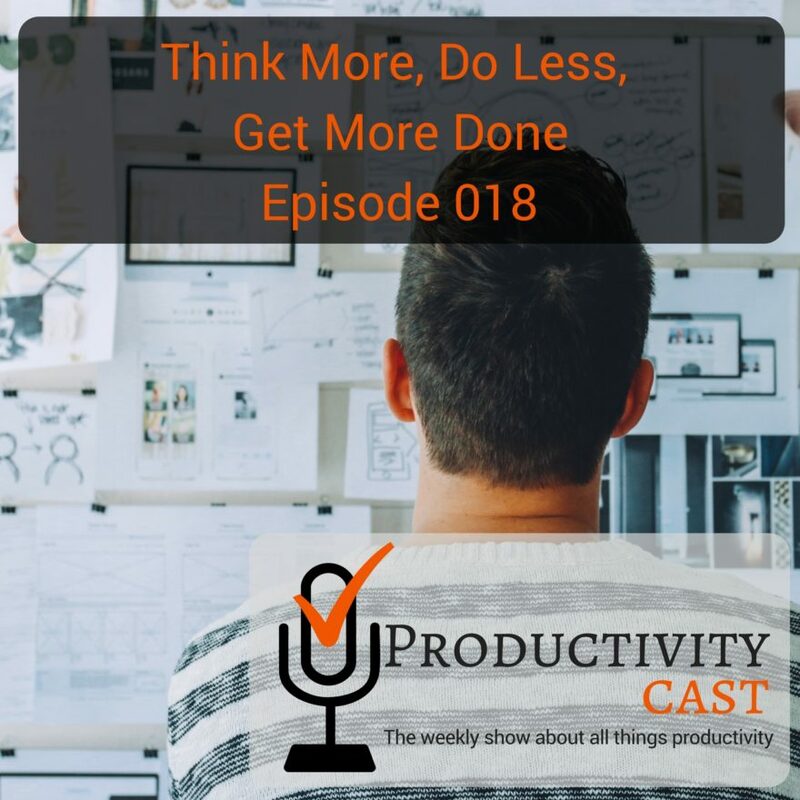 And, that’s what the ProductivityCast team entertains in this cast–the importance of planning and getting into action so that you can get more done by thinking more about the right things and doing less of the unproductive things on your way to your goals. So, enjoy this episode on how to think more, do less, get more done. Give us feedback! And, thanks for listening! Are you ready to manage your work and personal world better to live a fulfilling productive life then you’ve come to the right place product to be cast the weekly showboat all things product to Vittie here your host Ray Sidney-Smith and Augusto Pinaud with Francis Wade and Art Gelwicks Hello and welcome to productivitycast the weekly show about all things personal productivity I’m Ray Sidney-Smith and I’m joined here with Augusto Pinaud and Francis Wade Welcome to the show guys good morning oh is everybody doing to be back I’m doing really well and today we’re going to be talking about thinking about thinking we’re going to talk about thinking about your productivity system and getting into action and we were just talking before the show recording about this study that was done back in July of twenty seventeen what these research scientists have discovered was that Ravens or corvids the birds known as corvids Jays crows and ravens all showed signs of planning I’m reading here out of a science mag dot org article which I’ll link to in the show notes and so it turns out that humans apes not monkeys and birds all have the ability to plan and as the article says quote planning is the ability to think through future events taking place at a different location and quote and so really for us thinking about our personal productivity I think it’s really important for us to all think about how we plan how we think about the future in the perspective of getting things done and so for me I really have always stood on the the the perspective or stood from the perspective that our cognitive skills are very similar to the way in which athletes condition and plan for competing in events and that week I think that we miss appropriately think that we’re all. Running marathons when in reality we’re actually playing you know small sprints throughout our lives even throughout our days and we need to be conditioning ourselves and planning effectively for each of those variety of sprints and our specialized sprints right so particular type of Sprint that you would prepare for would be in a in a say of racing or running you know athletic event would be maybe the pole jump or you know the long jump or you know the five hundred meter dash or something like that you know each of those requires you to work out for tequila things but it’s also planning out the strategy of how you would compete in that event and I think a lot of that is power a wild with our own personal productivity as well as a personal productivity systems you know I’m quite beem a big job and I believe that thinking and planning it help you tremendously when you get into good later called the auction or the reality is that all of us been on productivity or intra and two shift or an expert or whatever you want to call yourself about productivity or not you have the same problem you have an incredible amount of time and you have an incredibly poor gives amount of time to do all of those those work problems are coming the difference from TIME BETWEEN A P one person who is brought up to be called up or tried to run a vision versus the ones who are not comes into this thing can come into this plan because you think about it and you need to go to one place and you get to that whites Let’s put an example let’s say the girls there is something most people when you go to the grocery and serve them going to make dinner today I’m going to put the chicken break so you go to the groceries and buy chicken get home and then you open the recipe and say Oh well I. Alternate garlic get in the car go back to buy garlic from by step three or I mean only go back for the third time and so far so on prevention are you going to make the recipe or the chicken for the night yes it’s going to be unaffected and efficient way to know that there wouldn’t that recipe what gives you the very soul of somebody being given planning before if instead of that you will have grabbed the recipe and shared Well I mean chicken or any garlic I need on him or any whites and when you go to the grocery you pick the four you will have external drive to the grocery transfer four times you will have been able to be the one you will have been able to go get home every to really get the project done in this particular case there are there is no difference between that example can any of our on your professional life the main difference between making dinner and a problem that you have from your professional life is that the recipe is not real and you need to be the one to create That’s right that’s a little bit a little bit differently and the only distinction I would draw is that cooking is a learned skill whereas something like running we can’t remember the last time when we learned to run but people can burn at the time when they learn to cook so most all adults know let’s say we know how to run. And don’t think about running as a scale which is subject to development or even something they want to develop they can live a life without learning to run any better better more efficiently so it’s more inherent so therefore it goes to sleep I think most people I think proclivity is more like running where whereas we learn the concept of time when we are six seven or eight we are able to teach ourselves. Create. Ask somewhere in or adolescence and we learn methods teach ourselves methods to manage tasks somewhere in our teens but by the time we get the dog heard it becomes for most people who we’re talking to or isn’t new to this park us every learn how to manage task and they can’t remember how they got there so it doesn’t appear to be a skill that is picked up at some point in their life it’s more like running and not as much like cooking which which is something you definitely learn a lot of people can’t do I can’t begin to me and I think because press of productivity is sort of. Blind where whole of black intell or development of it we make we’re going the wrong directions when it comes to trying to make think about our skills to improve it so people people can really be convinced that all I need to do is the bag buy a new device and that device with improve my productivity and they can also be confused and say I need a different job because the job I has I have has too many tasks associated with it so I need a job that has less tasks and I think those are two of the mistakes that people make when they think of their productivity they go to solutions that have nothing to do with their own or an inherent skill they look for external solutions I think part of the three of us do is try to bring into people’s consciousness this notion that your capacity and the mistakes that you experience because you are managing your productivity well are yes somewhat a function of these external things but they’re also a huge part of the skills that you use every day so I think we spell out the time finding that message and trying to get people to buy into it and some do and then some zones I think that it’s really important for people to recognize as you said Francis that there are certain skills that we are very comfortable with and certain skills that we aren’t sort of like that. That you talk about you know where we all sort of know that we can run even though we don’t really remember that we can run versus other skills where we had to learn them and there was a discrete moment in our lives when we started learning that process like learning to drive or otherwise or other kinds of rites of passage into adolescence young adulthood and then adult life for me I really think about the very concrete skills necessary cognitive skills that are necessary for example the thinking skill of clarifying what something is and whether or not it’s actionable you know in sort of the Getting Things Done or G.T.D. methodology that’s a very important thinking skill for planning whether or not to do or not do something planning it in and of itself has its own construct as we talked about the top is is a core function that has benefited humans for our entire existence the ability to delegate I think is so important and practicing each of these I really think that practicing each of these in their own right is also really important so planning delegating deferring tasks appropriately that is I’m not doing this now for very good reason so I’m going to do this at a later at a later time like when you’re emptying your inbox you may be clarifying and organizing the things that are coming into your world so that you can get them done in a more efficient place or time grouping similar tasks or projects are really important skills to learn and for me is actually also creating conventions and this can come into the into place of naming conventions for tasks and projects naming conventions for your folders that make up your world you know your hierarchy but also conventions in terms of how you structure the tools that you use in your world I’m a huge advocate for consistent structure right so that your Google Drive or Dropbox or your local hard drive has the same. Folder structure as your e-mail folders are labels and G. Mail and connected to the same stacks and notebook structure as your Evernote account or one note or whatever else you’re using and even to extending that your calendar that thinking beforehand creates a level of consistency and clarity about how to get things done on the backend that you otherwise won’t be able to access when you’re in the thick of it when you’re really in action mode you don’t want to have to double back over is the system set up properly for me to be able to make action right it’s like being a fighter pilot being in your plane middle of a firefight and going wait a second are the engines and proper maintenance joy have the bullets or the bullets checked to make sure that they have ammunition in them those are not the kinds of things that you want to really be thinking about when you’re in a firefight you want to focus on the strategy of your of the of the person attempting to shoot your plane up at Sky So you know that that’s certainly high stakes situation but even in low stakes situations I think the same things apply I think we should be giving that level of attention to how we’re really dealing with the world around us in terms of creating consistency I agree I think I think when I when I when I do training is use your example of clarifying Dunning delegating it so forth what I’ve discovered is that I don’t are already doing these things you know they may not call it that it may not know what they’re doing it may not be able to explain it but once it’s this thing which they can see well yeah OK yeah planning you mean thinking about what I’m going to do before I actually do it and coming up with a kind of a mental plan for the day yet another so there’s the skills that we’re focusing on are skills that people already demonstrate demonstrate if we’re at the watch them as people who are effective or people who talk about these things we watch the average person we could see moments where. They delegate under for and you may not be able to pick it out the same way you might put a someone who can run if you put under one hundred meter dash someone who’s an expert would say oh this is a start for is this is when you and the drive phase as when you got to the momentum phase and this is when you got to the finishing phase which is the same thing is that using both uses it’s just that the average person doesn’t know these phases and when they’re running underneath the dash they would have no idea what one phase is from the other so when we’re working with people and we’re sawing them and distinguishing these behaviors and the skills they’re able to see all that’s what I already have that the some come I’m already obviously doing some of that already the pulse of thing I think in what you said is that when we are able to distinguish it for someone so that they can distinguish it for themself then that person can improve now as when we separate it from the mishmosh of stuff that they do and stop the understandable themself then they have another bit of access to all K. Know that I understand what delegating is and I know that I do it kind of haphazardly and badly and that all follow up and understand what it is no thanks really know I can take it to the next level that you’re describing So it’s that initial giving the person the ability to distinguish the skill for themself that they’ve already been doing is what gives them a platform to get better in the future and without it they it’s really hard to get that it’s more a matter of luck than it is of distinguishing a skill which is I think a cognitive back to Haiti and I think that a lot of people think that they’re either planners or non planners and to some great extent I I tend to see the world that way there are planners and non planners but the reality is even if you are a planner there are good kinds of planning and some unproductive kinds of planning and so those are those are areas where even if you say oh I’m actually a pretty good planner Well if you start to categorize the type of planning you do you’ll. The good parts about parts about your planning abilities for example I’m a planner who really likes big visionary planning and writing out the plan and doing research and so it’s a forth but then creating the action more actionable stuff which has taken me many years to hone that skill of how do I actually plan out the details enough details to get me going I was actually not born a very good planner in that regard so I had to learn those skills it ends up being how what kind of planning you are strong and where you might have deficits in your planning abilities for you for your own personality your own style so I think that’s also really important to take hold to take note of I mean want to are a bearable to me to more complex to understand in some one we may need to to put some kind of profits Michaud notes but so for more people who are more visual to to get there but I think you recently stench between what we know when you want to call the amateur the pro and the distinction of use to come from a book from a student Prestone And I think the planning and the doing they also need to go small so you have the people who are pros I’ve been a planner as well of doing but you have also the people who are not who they may be a pro planner but they may be on a McLaren tour and you have obviously the people who are on the Macare on both plates and the cape as a planner and of something but the people who tend to struggle the most because they don’t know how to do good planning they don’t know how to do good doing OK Obviously if you pick the opposite so the pro planner and producer or obviously those are the people that do tend to call you know highly offensive in the sense that they are really good at planning but on the same time there are two really good at making that point and I. Securing that plan but complexity of barrels but it make or show you where you need to focus some kind of energy to be able to make the distinction from where you are and what So you mention going to go I am a really really good planner and I really needed to work for years in improving the they do or side put them on a similar level so both of them are pro level. In the same way you have that you have quarter people who are out doing under plan in the park and it’s like you so the question is Where are you in relationship with those two because the reality is you need you need to think more in order to get more done and you know the title of this they think more do get more done and I understand it may be confusing because well what we’re saying is well you need to be better plan in order to do but when we mean do less doesn’t mean the firmly do live action what it means is do more appropriate action make sure that the plan that you are creating is a play a couple it’s executed so that you can come to the third part of the title of this purpose so that it’s get more done that is where does this tension between the pros the material or very simple Where are you located in this spectrum of being a pro or no it’s in regards of your planning abilities I mean regardless of your action ability or do or ability to be able to grab that client and actually execute it I don’t particularly like you been a fantastic planner I think I got lucky and plan for forever there actionable part it’s always been the. Part but in comparison to my planning it’s been like you know I kind of mean to get there with you know Indiana Jones of style and make it how apart but why is the quest why we have. The second question is what can we do so we reduced that part or not that word so what can we do if we are not a pro bono can we work to make the other one much better even to the level of and by the way I believe we can I think so and I think a little bit of the history behind why this happens I mean from a from a developmental evolutionary perspective we as humans didn’t have to deal very much with much of the future for the early part of our existence right we basically were hunter gatherers who hunted for today’s food and ate today’s food and it wasn’t until we started to cultivate lands in just the last you know probably ten thousand years that we actually started to create what we consider sort of the modern era of civilization so we just have an R. R. R. Brains haven’t had a chance to really catch up with regard to what it needs to do in terms of planning long term and the fact that we can plan so long term and so well in really a relatively short period of time as a testament to the human condition I think it’s really important that we all take into account that we are still evolving as a species the reality is is that we weren’t really designed at the outset to deal with such exponential growth in our need to plan so we do need some support we need to practice we need to actually build those skills because they’re not ones that were requisite for the bodies in which the brains in which we live we just sort of need to build those skills and I think that passing those skills on as well to our children and to to to any use in your environment even if you. Don’t have children the use in your in your influence sphere is really important I think it’s important for us all to be teaching these kinds of productivity skills these planning skills to our young because I think that that will maybe hopefully kickstart the evolutionary process in a way right now that we’ve discussed the ideas of how do we use thinking and planning I wanted us to have some conversation about how to use thinking when we want to get more done Funnily enough I see a big connection between what we’re talking about this week and what we talked about last week about thinking about you or your productivity as a system that is subject to improvement based on in best a Geisha and sort of experimentation is what I would summarize last week’s episode as focusing on and I think the people who are really effective in today’s world as they transition into the real world they look to do some of the things we talked about last week starting with some of the things we talked about this week they find a way to for example planning to find a way to define the gap between their current skills of planning and the best planners in the world they operationalize those the gaps into behaviors that they can teach themselves over time or be taught all the time by if you can afford to have a personal courts or or someone who can be with you all the time kind of linking in with with deep deep work with deliberate practice the idea that someone would point out your weaknesses and sort of focus your efforts on improving the weakest points that’s the best way to get better but most of us are stuck having to teach ourselves the number of experts who can you know stay with you to improve productivity every day for the next week is probably really small and more who can afford that is you know limits it even further so the individual is we’re left our own selves our own devices to fill the gap and to get better and I think that by itself the move. Meant from figuring all that you have skills figuring out that there’s a hierarchy of skills that there are experts on there somewhere figuring out what the expert does translating the experts behaviors into behaviors that you could do on a continuum that connects your current level up almost to their level of performance and then managing yourself that experimentation and then deliberate crack. Whore you might do it that’s a whole skill in and of it’s that I think applies everywhere in life sports performing arts productivity being a great mom I think it applies everywhere and you know the great thing about the infamies is that we have access to really high levels of expertise it’s just that the gap is the power F. And that we’re weak at managing or selves in terms of sort of moving up a hierarchy of skills I like I like that idea of the parallel between Abraham outflows hierarchy of needs and a hierarchy of skills I’d love to put together a pyramid of skills necessary toward highest productivity I think will be a great graphic I won’t take credit for anything but I have something that. I’m well feel free to feel free to some of the lots of it and I wanted it to show it out. There with a very urgent call to me on the I mean. Just the time base productivity I’m not not everything productive and I think I’ve said I think yeah I think I think I’ve seen that graphic before but send it along anyway because it’s I think would be helpful for people to see a show. Do you want do you want to talk a little bit about your perspective on getting into action mode yet a friend said Ari are my believe on the thinking on the planet and one of the biggest enemy or you’re thinking of the point in time is finding that we tend to think that. We are to be seen and we don’t have time to think because all the things that we have to do so we tend to go into action before we really can get on that guilty of charge and I have done it more than what I should produce ago looking at the problem and say what I can do that will force even a further way to slow down and to be able to be a better planner because as much of the doing is great if you’re doing the wrong actions doesn’t matter how many of them you are doing you’re not moving to the place you want to go so with that in mind I came with an idea that I call the time the extraordinary hour and the consul returning early hour is a simple one. For forty five minutes to an hour and get rid of every electronic piece of paper and everything I get a blank piece of paper and that is all that I have been proud of and the idea is to try to solve a problem but it’s not necessarily into my lives or at least not in a way that will require research. And solving problems that are part of my project yes but a year is to move for connections look for patterns and if spend time thinking sometimes I think a project and that’s what I do that’s fine but the important part is to get into the exercise of putting the brain seemed to be her engage the brain in a different way my experience over the years where there has been priceless because it has allowed me to solve problems in ways that I did not study was possible for one but certain ways that I didn’t know that I could solve and so on and has been really lucrative for me the problem is we tend to fail because I don’t think I need to do do do do do. Klein except when you are in that mode of do do do do do do it sometimes you end up doing a bunch of that are not important are not critical are not urgent and are not even available when you miss the opportunity to work on those but we’ll have green remake of their plans because you’re so focused into Let me try to do let me try to claim this and let me try to get it to civil getting to see you or sometimes it’s important but we’ll never be doing the most important action on the auction we must employ in your day to day activities I mean and I think for me an issue of identifying at the point of getting into action two fundamental components for me one is motivation and the other is physical readiness and I mean that in the sense of what do I have my disposal my resources whether it be the appropriate tools as and resources in terms of maybe the people I need or whatever else I might need in order to be able make that thing happen and my physical state you know literally how I physically feel as well as the mental components of how I’m going to approach a particular task problem challenge what I what have you and so you know really getting into that into action mode for me is many times forecasting what that thing is going to look like if I can visualize it in my head visualize myself doing it in my mind’s eye then I do it really well and faster because of that and so I really find my to find the idea of visualizing yourself doing the task before you do it very very powerful and again this goes back to our study of athletes and high performance athletes it just goes to show that you know when you visualize yourself doing something successfully you’re much more likely to get yourself. Close to that successful outcome even to the effect of actually visualizing a potential hurdles pun intended you actually can go ahead and visualize yourself approaching those challenges and how you actually visualize them is actually powerful it is powerful in helping you to overcome them eventually I like to really think beforehand what I’m going to do I like to also think about my motivations right why am I doing this and this might happen on many levels right because when you are in the throes of your day at least what I am I’ve got bunches of things that could be distracting so I need to refocus myself on why this thing is important call Bob about X. Why don’t why do I care about making another phone call I really don’t want to make another phone call but if I can still take it up a notch and say oh this is related to project a oh right and this is actually associated with my horizon two which is my area focus and accountability isn’t getting things done or gee dealing go again this is you know my desire to be good at X. My role this particular role responsibility in my life and this is also tied to this long term goal that I have in mind while making this phone call is really important to moving that Peg forward or got to that project that role that goal and if you can if you can just briefly it takes a microsecond for you to have the thought and to connect those dots and then I’m off to the races I can really make a line drive when I am hyper focused on the motivations and I feel that I’m mentally ready for it because I thought about it beforehand and I discovered something a lot of similar And maybe that’s not my thing that. Every activity that we can think of like the one that I. Just mentioned or visiting There’s a myth the activity that experts see goes with it so there is before you were in a hundred meter dash for example back to the. Track there is the visioning that happens before it there is a warm up that happens before which is really important there is the Nikki sure that you stay warm the big drum in Jamaica No because you same boat pulled up in the hundred meter relay because they held the athletes for so long that they lost the war that they had in their muscles they got caught and then he pulled a muscle is kind of what we’re complaining about us Jamaicans but there’s method activity that goes with every high performing activity and what I hear you guys are talking about is what are some of those make the activities that prepare you to do the activity and flow state is is one that comes to mind which is similar to Kanu port’s deep work and symbol of the deliberate practice that goes high per productive moments very similar to what was to talk about his one hour highly productive all and preparing to get into that state either an exercise recently were asked OK what does someone need to do to get into the flow state stay in it and exit it effectively and I came up with something like fifteen skills between fifteen and twenty skills a huge number of skills which I had no idea existed and they had to do with things like blocking your and your physical environment and your visual environment from interruptions telling people around you that they shouldn’t interrupt you for the next time period making sure that you have a way to exit at the right time so that you don’t lose track of time and then run over into your next appointment making sure you prescheduled the time that you’re actually going to get into the flow state so when I broke it down I was I was shocked at the number of skills I came up with follow very quickly just kind of restore me with myself in that that are mental skills with respect to the floor state so there’s a whole bunch of high performing skills again back to back to the track or. If you’re a dancer or if you’re an artist producing apiece. Or whatever the activity may be if it’s one that’s worth thinking about then requires some kind of focus there is a whole range of myths activities that if you don’t get those right you may never get your potential in terms of when you actually do them and once again the method activities if you can find them on the Internet you know in a single if you’re really lucky but the chances are you might have thought somebody who is an expert and trying to figure out what the heck they’re doing before they do the activities that they can do the activity I guess I call it some kind of cyber cyber productive stalking that I have no problem with that. Though they’re legal. How do they do that and I did. A lot of. One of the pre-op there with the video of the trigger the get the you know this is this it’s actually my thoughts on I want there to be an opportunity for and maybe we can ask listeners to do this I would love for us to be able to get folks to send us screen shots of the of their of the screens of their phone of the applications that they use and that for the pure purpose of seeing whether or not there are apps that might surface in our collective knowledge of productivity apps that we may not know about you know like many times I I do pretty thorough searches of the app stores but that doesn’t mean anything because the app stores are subject to flawed algorithms so you might serendipitously happened upon through Google search an application that you now use on your device that someone might not know about and I think that it would be really useful for us and I know that it’s something that we have for a long time having you on Francis as our resident technology contributor is to is to really focus on what apps do exist out there for people and and surfacing those for us so. So that’s kind of of requested stalking in a way. So I’m curious if people would would submit it made to favorable or if yes but I mean I mean I don’t want to see anyone’s private information I just want to see the apps. Go. Sending us anything crazy so I phoned it easier to get into the flow is that because I have one is block of programs in Chrome blocks Facebook and the feds so you’re you could discover that the very productive people luck social media during certain hours so that they can be more productive thing you could even do it could even go further and say the presence of an app implies that the use of an app could imply that someone is being more productive and that could be met the activity that helps them to be productive so could the number zero PUT THEM number of obstacles is an argument that says that highly productive people don’t have screens with hundreds of ups and keep hundreds of hours on their desktop they keep a few so they could be a correlation there you are in between having lots of ups and just the minimum that you need to be effective so I’m totally with you on this we should do it yeah I’m game I think I think there’s a couple of things here right so it’s it’s actually coordinating the nexus of the dimensions of what actually is Corella given what’s not so for example the category of application would be one vector in this along with the number of apps so if the number of apps is dramatically if you did a scatter chart and you saw a large group of people with very few apps and a large group of people with a lot of apps then you would be able to then ask that secondary question against that enemy there probably are with some Python help you could then use that second dimension to see the category of applications that they have and be able to discern from that which ones are. Highly productive in that subset and those that are highly unproductive and the other subset we might have to have a data scientist come in and I know a couple of data scientists who might be able to come in and maybe do a little bit of statistical analysis for us to give us some I wanted I wanted as we close out to hear any final comments any final thoughts on thinking for clamming products of activity as well as thinking for getting into action we only touched on reflecting But of course that’s that super important that after you’ve after you’ve acted to. Cull How well did X. How does it compare against my personal stand the does it help me to get to the next level so that the math final thought is that as a scale reflecting on a whole where you’re doing what you just did recommend that we thought last week I think is is a really important skill because once again we need to have this expertise within us we don’t have access to most of us don’t have access to someone else who can tell us so we’ve got to somehow find it all for ourselves but economy between the thinking and there is a really really important difference between that plumber on the door one may thing just need one or the other I just need to be able to plan or where I’m good and I’m there for the do it happen our armored will do or why in the plan I can you know brute force my way to six very out it is past time progress around the bar of those times get complicated. The number by rebels and actual screen permeation you are going to make those two skills pretty critical because is what is going to allow you to be in which between the things that are going to allow you to reach your destination or the place you want to go if you want to a problem and the things that are simply not but are simply. Wrong to make you slow down that are going to simply make you you know get behind even don’t you are competition all these options and you’re crossing them out of your minds so if you are not Truong or Pearl on thinking and planning you know I think it’s important when you start taking some time weekly or leave but a better daily to get that muscle to improve some By the way you could see that maintain time of perfect you’re doing on a positive way and you start again and accomplish the things that are important and critical for you in a March this year well said Well said Well thank you everybody for joining us here for perks of accounts the weekly show about all things personal productivity this closes another episode and we will talk to you again next week so here’s your productive life and that’s it for this productivitycast the weekly show about all things productivity with your hosts Ray Sidney-Smith and Augusto Pinaud with Francis Wade and Art Gelwicks.